The first one I joined was Scrap-bee Block. 1 block per month and we use our own stash to make other members blocks. I made the donkey block for this bee. 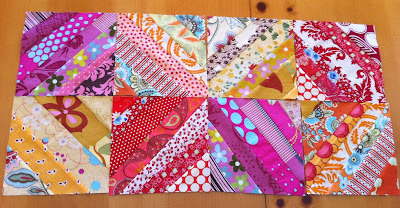 I also joined [3 x 6] Sampler Quilt Mini Bee. There are several hives in this group and 7 members per hive. Hive members choose their colors, but you get to choose what kind of block you want to make for them. The same block is made for the other 6 members in your hive using the colors they request. The beauty of this is that it only last 3 months. 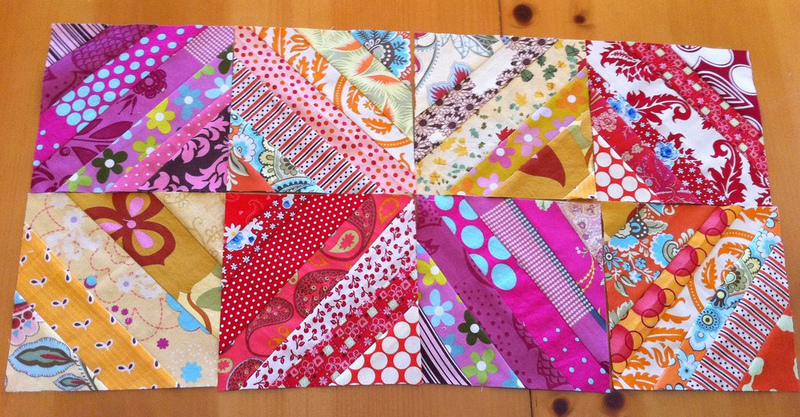 3 months to complete 6 blocks seems easy enough to manage. I wanted to be in a bee with my guild members. So, I started Seams Perfect: A Modern Scrap Bee. 7 of us are from the guild and the rest of the group are great girls I found on Flickr. 2 Blocks per month and members use their own stash to make blocks for others. I did give them the option to send out fabric if they wanted. No one wanted to go first, so I did. These are the blocks I made. I used this tutorial from Ashley at Film in the Fridge. Aren't they lovely? I can't wait to see how the whole quilt will look like. Oh, and did I mention that I'm the Bee Mama?